Bolivian President Evo Morales isn't South America's first indigenous head of state  that honor belongs to Alejandro Toledo, a Quechua Indian who was President of Peru from 2001 to 2006  but he's certainly the first to capture the imagination of the world outside South America. 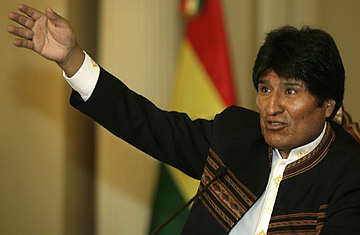 Morales, first elected in 2005, was the continent's Barack Obama before there was Obama. He is an Aymara Indian and former coca-growers union leader who won the presidential palace while still in his 40s, just decades after a time when Bolivians of his class and skin color weren't even allowed to vote. Morales hit the global stage with retro, Che Guevarainspired leftist politics and colorful Aymara fashions. But the real question was whether he could actually govern and even improve South America's poorest and most volatile nation. Bolivian voters, at least, issued a resounding yes in Sunday's presidential election: the initial tally shows Morales, now 50, winning re-election with 63% of the vote, almost 10 points better than his 54% showing four years ago. He defeated his closest opposition candidate by 40 points. His party, the Movement Toward Socialism (MAS), won two-thirds of the seats in Bolivia's Congress. As a result, said Morales, "I am obligated to accelerate the pace of change." The statement was sure to buoy the indigenous majority that makes up his base while vexing the more conservative white minority he has sometimes violently butted heads with. Morales sailed to victory thanks largely to that indigenous cohort, which is concentrated in Bolivia's Western highlands and makes up about two-thirds of the country's population. Like Hugo Chávez, his left-wing counterpart in Venezuela, Morales has lavished unprecedented social programs on the poor, including free medical care, stipends for new mothers and the elderly, and a massive program for literacy that includes payments to low-income families who make sure their children attend school. "Evo knows what it's like to be like us," said Ilda Condori, an indigenous voter waiting outside a polling station in the impoverished city of El Alto that adjoins the capital, La Paz, 12,000 ft. high in the Andes. Looking down at her 8-year-old daughter, Condori added, "Because of Evo, I can afford to buy this one schoolbooks and some clothes every year." But analysts say it wasn't just Morales' social largesse that ensured a larger landslide this time. Critics foresaw macroeconomic disaster three years ago when Morales, fulfilling a campaign promise, nationalized Bolivia's vast natural-gas reserves. Among the doubters was the International Monetary Fund (IMF) in Washington. Today the IMF is hailing Bolivia's projected economic growth rate of almost 3%, one of the hemisphere's highest, as well as the fact that the country's economy has averaged almost 5% annual growth since Morales came to office, Bolivia's best performance in three decades. "Bolivia is the most profound example that the conventional wisdom of economic growth  that you need to attract foreign capital at all costs  is just not true," says Mark Weisbrot, director of the liberal Center for Economic and Policy Research in Washington. Despite the energy nationalization and Morales' strident anticapitalist rhetoric, Weisbrot adds, foreign investment is higher now than it was under many of Morales' predecessors. Much of that success was driven by the decade's abnormally high prices for commodities like natural gas, and it was hardly expected from a man who, like Brazilian President Luiz Inácio Lula da Silva, did not attend college and concedes he didn't know what inflation meant before he became President. "When Morales admitted [during a visit to the U.S.] that it wasn't until after his election that the concept was explained to him, eyes grew wide," says Martin Sivak, author of a Morales biography, Evo Morales, due out soon in English. "He barely finished high school, but he's honest about his lack of knowledge, and he makes up for that by surrounding himself with experts." But while Morales has stabilized Bolivia's economy, he has all too often polarized its politics at home and abroad. "The country has become much more conflictive because of Evo," says Ximena Delvillar, 36, who lives in a relatively affluent section of La Paz. Bolivia, in fact, seemed on the verge of a civil war last year between the indigenous people and the white economic élite of the Eastern lowlands. That upper class is hardly blameless, but even Bolivians sympathetic to Morales complain that he and MAS have consolidated inordinate power and are wielding it with a vengeance against political foes. Several opposition leaders are under seemingly arbitrary investigation for financial fraud, illegal land holdings or ties to a supposed terrorist cell the government claims plotted to assassinate Morales last spring. The government also has flooded the country with enough Evo hagiography to rival Fidel Castro's overweening personality cult in communist Cuba. Sivak acknowledges Morales' sometimes autocratic bent. "He inherited this from his years as a union leader," he says. "He has trouble trusting others, and so it means he's involved in 50 decisions every day, which is not always a good thing." But the process earlier this year to rewrite Bolivia's constitution, which increased indigenous rights and let Morales run for President one more time, satisfied democratic criteria; and even Morales' decision last year to expel the U.S. ambassador to Bolivia, Philip Goldberg, for allegedly meddling in Bolivian politics was supported by most Bolivians, who feel Washington's insistence on drug-war and free-market cooperation hurt the country in the 1980s and '90s. Sources close to the Bolivian President tell TIME that as U.S.-Bolivia relations improve under Obama, Morales plans to reinstate a U.S. ambassador soon. Meanwhile, the crowd outside the presidential palace in La Paz Sunday night, Dec. 6, seemed to celebrate Bolivia's indigenous past as well as its first indigenous President. Banners and T-shirts sported the faces not only of Che but of Tupac Katari, the leader of an 18th century Aymara uprising that almost drove out the Spanish colonizers. Katari was eventually captured and drawn and quartered, but before dying, he warned, "I will return, and I will be made of millions." His quote has been oft repeated since Morales won his first term, and it will no doubt be heard again throughout the second.